It's been unseasonably warm and sunny spring here in Vancouver and now that it's April, I'm waiting for that other, rainy shoe to drop. One of the benefits of living in Vancouver is that I rarely have to worry about driving through ice and snow - but with our frequent rainfall, hydroplaning is a real danger. Hydroplaning is the skidding that can occur when your car tires come into contact with a wet surface. 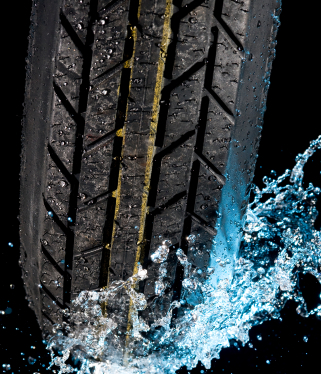 When the grooves in your tire can't sufficiently scatter the water on the road, your tires lose traction on the thin film of water between them and the asphalt. When you hydroplane, you temporarily lose braking and steering control, making it dangerous for you and anyone else on the road. Any wet surface can cause hydroplaning, but when are roads the most slippery? The most perilous time is during the first 10 minutes of a light rain, when the water mixes with oil residue on the road, creating extra slippery conditions. Slow down when roads are wet - reducing your speed makes it easier for your tires to scatter the water and stay in contact with the road. Drive in the centre lanes; water tends to accumulate in the outer lanes. Try to drive in the tracks of the cars in front of you. That way, water has less of a chance to build up in front of your tires. Avoid hard braking. Keep your braking light so as to not lock your tires. Avoid making sharp or quick turns. Keep your tires properly inflated and be sure to rotate and replace tires when it's time. Even if you follow all of these tips, you may still end up in a slippery situation. If you do start to hydroplane, don't panic! Don't slam on the brakes - just ease off the gas and try to continue steering your car in the direction of the road. Keep this up until you can feel your tires making contact with the road again. Got some hydroplaning-avoidance tips to offer? Share them in the comments!